In his youth he helped create the most fearsome weapon of war the world had ever seen. In his later years, he worked equally hard to banish such weapons from the face of the globe. He won science's highest prize early in his career, but his quest to push the boundaries of scientific knowledge would continue unabated for decades to come, as would his determination to speak out for causes in which he believed. Owen Chamberlain, Nobel laureate, professor emeritus of physics at UC Berkeley, member of Ernest O. Lawrence's legendary “Rad Lab” team, and one of Berkeley Lab's greatest scientists, has died. He passed away quietly in his home in Berkeley on Feb. 28, following a long struggle with Parkinson's Disease. He was 85. 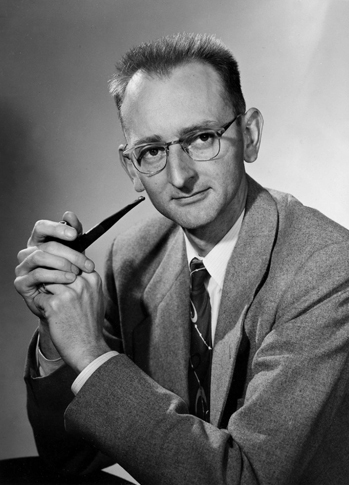 The tall, thin, avuncular and witty Chamberlain is most remembered for his role in the discovery of the antiproton in 1955, a role for which he shared the 1959 Nobel Prize in physics with his Rad Lab and UC Berkeley colleague Emilio Segrè, who died in 1989. The discovery of the antiproton, the mirror image counterpart to the proton in ordinary matter, was made possible through the combination of the Bevatron accelerator, the world's most powerful at that time, and a unique detector, designed by Chamberlain and his colleague, Clyde Wiegand, that was set off only by particles moving at the speed predicted for antiprotons. Chamberlain was born in San Francisco on July 10, 1920. His father was W. Edward Chamberlain, a prominent radiologist who had a strong interest in particle physics. His mother was Genevieve Lucinda Owen. His family moved to Phila-delphia in 1930, where Chamberlain attended public school. 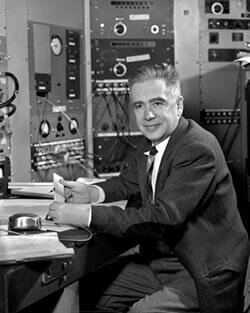 After obtaining a bachelor's degree from Dartmouth College in 1941, he entered graduate school at UC Berkeley, where he first met Segrè, a rising star in nuclear physics who would have a strong influence on his career. Chamberlain's studies at Berkeley were interrupted when the United States entered World War II. In early 1942, at the prompting of Lawrence, he joined the Manhattan Project, the U.S. government's secret effort to build an atomic bomb. Working as an assistant to Segrè, first in Berkeley and then in Los Alamos, NM, he investigated nuclear cross sections for intermediate-energy neutrons and the spontaneous fission of heavy elements. After the war, Chamberlain resumed his graduate work at the University of Chicago. His mentor there was the great Italian physicist and Nobel Laureate Enrico Fermi, who'd also been Segrè's mentor. He was awarded his Ph.D. in physics in 1948 and immediately returned to UC Berkeley, where he accepted a teaching position, (he would become a full professor in 1958) and was reunited with Segrè at the Rad Lab. 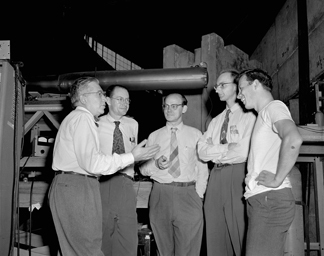 Chamberlain, Segrè and Wiegand made use of the Rad Lab's powerful particle accelerators — called atom smashers at the time — to undertake an extensive series of experiments on the interactions between protons and the polarization of smashed atomic nuclei. 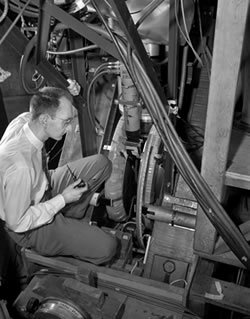 In 1954, Lawrence commissioned the Bevatron accelerator, a machine that was built to go after the antiproton whose existence had been predicted in 1928. Two teams were assembled to find the elusive particle. One team was led by Segrè and Chamberlain and included Wiegand and Thomas Ypsilantis. The antiproton experiments of Segrè and Chamberlain and their collaborators began the first week of August in 1955. On September 21, the future Nobel laureates and their team got their first evidence of the antiproton based on measurements of particle momentum and velocity. The paper announcing their historic discovery was published in the Nov. 1, 1955 issue of Physical Review Letters. Having won the Nobel Prize at the relatively young age of 39, Chamberlain would remain a highly productive scientist on the frontiers of particle physics for a great many years afterwards. In the 1960s, he lead a 20-year study of the relationships between nuclear forces and the spin of protons and neutrons. Prior to his official retirement in 1989, he was an active member of the group of Berkeley Lab scientists, led by David Nygren, who developed the Time Projection Chamber, or TPC, a particle detector that has become the workhorse of today's high energy and nuclear physics research. In addition to his scientific efforts, Chamberlain also became an outspoken activist for nuclear arms control and other issues of social concern. In the 1960s, he was a supporter of the Free Speech Movement and a strong advocate for increased minority recruitment and enrollment at UC Berkeley. He spoke out against the repression of scientists in the former Soviet Union, demonstrated against the Vietnam War, and was a founder of the nuclear freeze movement of the early 1980s. Chamberlain is survived by his wife, Senta Pugh-Chamberlain (née Gaiser) of Berkeley, and four children by his first wife, Beatrice Babette Copper, who died in 1988 — daughters Karen Chamberlain of Tampa, FL. ; Lynne Guenther of Ithaca, NY; Pia Chamberlain of San Jose; and son Darol of Ithaca, NY. He also is survived by step-daughters Mary Pugh of Toronto, Canada, and Anne Pugh of Oakland. A second wife, June Steingart Greenfield, died in 1991. Phytoplankton absorb atmospheric CO2; understanding them is vital to understanding climate. Strangely, despite the fact that plants don't thrive in the dark — and in winter the near-polar regions are very dark indeed — phytoplankton manage to grow at roughly the same rate all year round in the North Pacific Ocean. In 1996 oceanographer Jim Bishop, now in the Lab's Earth Sciences Division (ESD) and an adjunct professor at UC Berkeley, but then a professor of ocean sciences at the University of Victoria, uncovered an important clue. Yet it took several years and the efforts of many Berkeley Lab scientists to solve the mystery of winter-blooming phytoplankton. Ocean Station Papa is an empty patch of water in the middle of the Gulf of Alaska. There, scientists using instruments like MULVFS (Multiple Unit Large Volume Filtration System) have collected one of the longest time-series of detailed oceanographic data on record. In February, 1996 Bishop brought a MULVFS unit aboard a research vessel sailing to Papa. What he brought back was evidence of a plankton bloom during one of the darkest times of the year. Any bloom in this iron-poor region requires an influx of iron, which oceanographers had long assumed came from windblown dust. Yet there was no evidence of an Asian dust storm that could have precipitated iron in the North Pacific before the measurements were made. 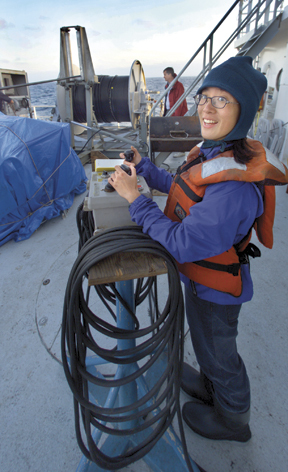 Bishop kept the anomalous water samples with him, and in 2001, when Phoebe Lam, then a graduate student at UC Berkeley, arrived at ESD to work on her Ph.D., he asked her to tackle the puzzle of Papa's winter samples. Lam enlisted the aid of Glenn Waychunas, who heads ESD's Molecular Geochemistry and Nanoscience Group, and who had a research program on nanoparticles and mineral interfaces at Argonne's Advanced Photon Source. Unfortunately it proved difficult to focus APS's high-intensity synchrotron beam on the particles in the samples withoutdamaging them. “Then we discovered that Mathew Marcus at beamline 10.3.2 of our own ALS had an ideal set-up for our purposes,” Lam says. Although the hot spots were mostly insoluble iron, which can't stimulate biological activity, soluble iron was present too. Where was it coming from? The coasts of Canada and Alaska are almost 600 miles from Ocean Station Papa, the Aleutian Islands even farther. How could soluble iron make the long trip without being consumed by plankton long before it reached midocean? The pycnocline, where density increases rapidly and prevents mixing of water above and below, averages about 150 meters down in the North Pacific, roughly the depth of the outer continental shelves. In effect it provides a surface on which particles can glide without sinking. Particles 150 meters down are far out of reach of phytoplankton, so by riding the pycnocline soluble iron can survive the trip from the Aleutians to Ocean Station Papa. But when winter storms hit, roiling the waters and mixing their contents, the deep soluble iron churns to the surface. “We think we have uncovered the mechanism that explains why the production of phytoplankton in the North Pacific remains roughly constant all year round,” says Lam. Berkeley Lab's big thrust into the promising young universe of nanoscience gets its ceremonial launch next Friday morning. That's when political leaders, Department of Energy managers, University of California executives, and scientists from the field will gather in the dramatic fifth floor cantilever room of Building 67 to dedicate the Molecular Foundry. An audience of about 150 invited guests will learn about the future of nanoscale research while taking in an expansive view of the Berkeley campus and San Francisco Bay through floor-to-ceiling windows. The six-story, $85 million gray-silver-and-glass edifice hugs the hillside on the Laboratory's south side, poised to seek imagined and unknown discoveries of more than 200 scientists and staff after equipment and furniture are installed later this spring. That's when Lab employees can take tours to get a first-hand look inside the facility. But next week belongs to the leaders, the funders, the builders and the designers who made it all happen. The View will have coverage of the dedication in the April 21 issue. Question: what Berkeley Lab scientist took a meeting with Bill Gates, dined with the founders of Google, rubbed shoulders with the Clintons, and had a near close encounter with Angelina Jolie? Answer: Jay Keasling, director of the Physical Biosciences Division and head of that division's Synthetic Biology Department. 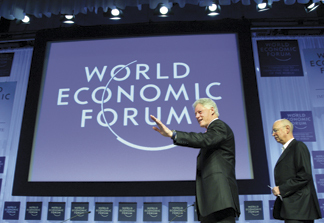 Keasling, left, hob-knobbed with several luminaries, including Bill Clinton, right, at the World Economic Forum. Keasling was in Davos, Switzerland, a ski village some two hours outside of Zurich, along with more than 2,000 other attendees that included high-ranking politicians, Fortune 500 CEOs, and a broad assortment stars from academia, the media, and the entertainment world, to attend the annual meeting of World Economic Forum. The event was held January 25-29. Keasling was there on behalf of the company he founded, Amyris Biotechnologies, which was named one of 36 “Technology Pioneers” in 2006 for its work in synthetic biology. Attendees heard remarks from a wide spectrum of speakers, including former President Bill Clinton, San Francisco Mayor Gavin Newsom, Gates, Dell Computers founder Michael Dell, Yale University President Richard Levin, and Laura Tyson, Dean of the London Business School. Amyris was honored for its groundbreaking work on the use of genetically engineered microbes to produce an inexpensive synthetic version of the life-saving antimalarial drug, artemisinin. As for the near close encounter with the activist-actress Jolie, Keasling was among the gentlemen cleared from a hallway when she was escorted into the men's restroom, as the women's loo was full. Dominican rice and beans with tostones; I could eat it every day! A cold front swept through St. Louis on the first day of the annual meeting of the American Association for the Advancement of Science (AAAS). For the next five days, from Feb. 16 to 20, temperatures rarely poked above 20 degrees Fahrenheit. Out-of-towners braced against the arctic air and scurried inside the nearest building. But inside the St. Louis Convention Center, scientists shed their coats, gloves, and hats and warmed to some of the most intractable problems facing humanity, including, ironically, global warming. The more than 5,000 people who attended the 172nd meeting of the world's largest science organization grappled with topics that sometimes read like bad Hollywood disaster movies: West Antarctic Ice Sheet: Waking the Sleeping Giant; From Breadbasket to Seafood: The Coastal Dead Zone; Through a Looking Glass Darkly: Earth System Models. These sobering titles were not by accident, and not without optimism. With a theme of “Grand Challenges, Great Opportunities,” the meeting pitted today's headline-grabbing troubles against scientists' know-how, ingenuity, and inclination to find a better way. A peek inside random conference rooms revealed talks on flooding, earthquakes, obesity, autism, aging, poverty, hunger, disease, environmental crises, animal conservation, and even the touchy subject of teaching evolution in America. As AAAS president Gilbert Omenn outlined in his opening address, this drumbeat of woes was meant to inspire. “The entire program is designed to challenge us as scientists, engineers, teachers, policymakers, and citizens to frame important scientific and societal problems in ways that create opportunities to apply the best in science and technology for broad benefit,” said Omenn, a Professor of Medicine, Genetics, and Public Health at the University of Michigan. Lab scientists Sally Benson, top, Jay Groves, middle, and Eddy Rubin, bottom, discussed their research during the AAAS annual meeting, held in a chilly St. Louis, Mo. And respond they did. Among the scientists who visited the frozen city on the banks of the Mississippi River were three Berkeley Lab researchers. 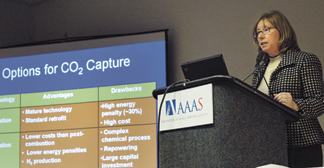 Sally Benson of the Earth Sciences Division discussed carbon sequestration, in which the carbon dioxide from power plants is injected deep underground for storage over geologic time spans. Over the next several decades, more than 1,300 gigawatts of new coal-based power plant capacity is anticipated, resulting in lifetime emissions of 735 billion tons of carbon dioxide. Without carbon dioxide capture and storage, operation of these plants will make it very difficult to stabilize atmospheric carbon dioxide concentrations at levels believed to be low enough to avoid serious climate and ecosystem impacts. “Carbon dioxide capture and storage is not a silver bullet. It is one technology in a portfolio of options. And there is still more work to do,” said Benson. Eddy Rubin, director of DOE's Joint Genome Institute (JGI) and Berkeley Lab's Genomics Division, outlined how the JGI is directing the technology of DNA sequencing to scan the environment for processes that will lead to cheaper and easier-to-produce biofuels. “We can then survey this vast catalog of biodiversity and harness the microbial pathways that catalyze the conversion of lignocellulosic feedstocks, such as wood chips, crop residue, and various grasses, into cleaner sources of energy,” said Rubin. And Jay Groves of the Physical Biosciences Division discussed his pioneering work developing biologically inspired synthetic membranes that combine nanotechnology with biochemistry to give scientists a unique way to study how life works. The new technique, called supported membrane nanotechnology, is already yielding advances in cell research and drug development. “It is enabling us to break new ground in what we can learn about biology,” said Groves, a chemist who also holds a joint appointment with UC Berkeley's Chemistry Department. Although such weighty matters composed the lion's share of the meeting, science's gee-whiz side was also on full display. A life-size replica of one of the two rovers exploring Mars drew a steady crowd in the exhibit hall. An astronomer from the Carnegie Institution of Washington unveiled a short list of stars that may harbor life-sustaining planets. Elsewhere, scientists discussed computer simulations that elucidate how fruitflies and dragonflies take wing. But it was the bad news that made the news, such as the Feb. 16 announcement that the amount of ice that Greenland's glaciers dump into the Atlantic Ocean has almost doubled in the last five years, most likely due to rising air temperatures. This discovery, reported in the New York Times and hundreds of other news outlets, probably seemed a little far-fetched to someone shivering in line for a taxi. But a quick scan through the meeting's program reveals that calving glaciers are very real and part of a long list of troubles — all of which demand the best that science has to offer. 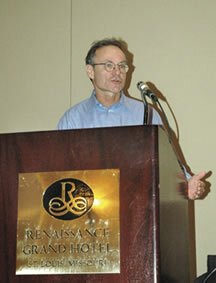 In his opening address, Omenn suggested how scientists can pitch in. “We should dare to study hard problems, individually when feasible, or in teams when the challenge demands multidisciplinary effort,” he said. He also cited a number of recent reports that underscore the importance of improving science and education in the United States, including the National Academy of Sciences report Rising Above the Gathering Storm, which Berkeley Lab Director Steve Chu helped author. As a final wakeup call, Omenn recounted a job he held more than 30 years ago, when he served as a White House Fellow assigned to the Atomic Energy Commission for the report Our Nation's Energy Future. The report called for technological advances in five areas, including clean coal technologies, as well as solar, wind, and geothermal energy technologies. When World War II ended in 1945, U.S. troops returned home and America got busy rebuilding. The post-war effort will probably be most remembered for a monumental boom in the number of births. Between the years 1946 and 1958 more than 70 million babies would be added to the population. These “boomers” would come of age during the 1960s and wield a tremendous impact on politics and culture that continues to be felt. But the 1950s belonged to the parents of these boomers and they, too, made quite an impact. The United States and the Soviet Union engaged in a “Cold War” of competing ideologies as both raced for nuclear arms hegemony. World War II's top general, Dwight D. Eisenhower, became president and cautioned the citizenry against the military-industrial complex. A vaccine was developed that saved children from the crippling ravages of polio, and a group of clergymen, led by Martin Luther King Jr., formed the Southern Christian Leadership Conference to rid society of the scourge of racial discrimination. The era began with families gathered at night around the radio and ended with them glued to their televisions, as Uncle Miltie and Howdy Doody replaced the Green Hornet and Lux Theater. The New York Yankees dominated baseball, Rocky Marciano and Sugar Ray Robinson dominated boxing, Marlon Brando and James Dean dominated the silver screen, Elvis Presley dominated the recording industry, and, in the hills overlooking the UC Berkeley campus, a laboratory led by an American genius of Norwegian extract dominated the world of science. 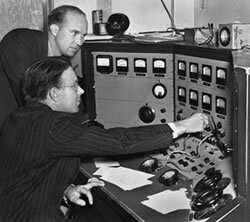 One of Ernest Lawrence's first big successes — outside what others might have considered to be the natural domain of the AEC — came when he convinced the agency to provide support for the radiopharmaceuticals research programs led by his brother, John Hundale Lawrence. A graduate of Harvard Medical School, John, who was four years younger than Ernest, joined his older brother at Berkeley in 1935 after teaching at Yale, where he studied the effects of radiation on the pituitary gland. The idea was to conduct biomedical studies with the products of Ernest's newly developed cyclotron. John had become interested in the potential use of cyclotron-produced radioisotopes and nuclear radiation in the treatment of cancer when, with Paul Aebersold, he discovered that a beam of neutrons had a much more destructive effect on tumors than an equivalent dose of x-rays. In 1936, John Lawrence founded the Donner Laboratory within Ernest's Rad Lab and in 1937 he used the radioisotope phosphorus-32 to successfully treat polycythemia vera, a bone marrow disorder. In 1939, he used beams of energized neutrons to treat a patient with leukemia, the first treatment of cancer with beams from a particle accelerator. 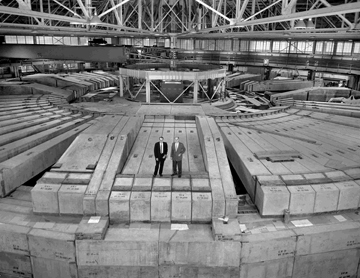 Following the end of the war, with access to the Rad Lab's mighty new 184-Inch Synchrocyclotron, and backed by AEC funding, John Lawrence and a star-studded team that included Joseph Hamilton, Cornelius Tobias, Hardin Jones and Will Siri, literally launched the field of modern nuclear medicine. Among their many accomplishments were the use of particle beams to successfully treat acromegaly, Cushing's disease, and several other conditions, the production of long-lived radioisotopes to label hemoglobin in red blood corpuscles and demonstrate that iron is transported to the bone marrow by a protein, and the measurement of the life-span of red blood cells. With Siri, John Lawrence also made expeditions to the Andes to study red cell production at high altitudes. This research led to studies of erythropoietin, the hormone that controls the production of red blood cells. In 1948, John Lawrence was named by Ernest to be the Rad Lab's first Associate Director. On Sept. 2, 1945, the day of the Japanese surrender, Ernest Lawrence is reputed to have told biochemist Melvin Calvin that it was “time to do something useful with radioactive carbon.” When carbon-14, a radioactive isotope of carbon-12 was discovered in 1940 at the 60-Inch Cyclotron by Martin Kamen and Samuel Ruben, scientists immediately recognized its potential use as a “tracer,” a substance that can be tagged to organic molecules and used to follow the fate of those molecules through different stages of a chemical process. With a half-life of 5,700 years, carbon-14 was ideal for tracing biochemical processes. The process that most interested Calvin and Lawrence was photosynthesis, the means by which green plants are able to convert sunlight into chemical energy. Photosynthesis had first been identified by the German physicist Julius Robert von Mayer in 1845, but even by 1946, all scientists really knew for certain is that carbon dioxide and water went into a plant and oxygen came out. Working out of Lawrence's original Rad Lab building on campus, Calvin organized a team of researchers to map the chemical path that carbon travels through a plant during photosynthesis, starting from its absorption as atmospheric carbon dioxide to its conversion into carbohydrates and other organic compounds. The team used carbon-14 as the tracer, plus new ion exchange techniques, paper chromatography and radioautography. Over the next few years, in the process of creating their map, Calvin and his team showed that sunlight acts on the chlorophyll in a plant to fuel the manufacturing of organic compounds, rather than on carbon dioxide as was previously believed. The chlorophyll uses radiant energy to split water molecules into hydrogen and oxygen. Separated, hydrogen and oxygen contain more chemical energy than they do combined as water. For leading the research that deciphered the photosynthetic process, Calvin would receive the 1961 Nobel Prize in chemistry. Pushing the boundaries of the periodic table continued to be a Rad Lab priority after the war, and a “Hot Lab” was established under the leadership of Glenn Seaborg, whose team included nuclear chemists Albert Ghiorso, James Kennedy and B. B. Cunningham. 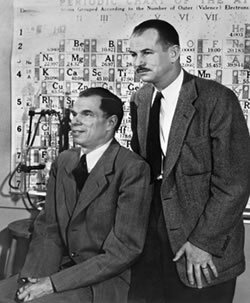 For their discoveries of neptunium and plutonium, respectively, the first two elements beyond the 92 naturally occurring elements, Seaborg and Edwin McMillan shared the 1951 Nobel Prize in chemistry. Following that joyous occasion, Seaborg and his “Hot Lab” team would go on to discover nine other elements plus numerous isotopes. They would also confirm the concept of the actinides, a heavy version of the rare earth elements. For all its successful ventures into disciplines other than particle physics, the Rad Lab of the 1950s remained first and foremost a physics laboratory, and in the 1950s, the biggest prize in physics research was the antiproton. The story began in 1928, when British physicist Paul Dirac proposed the existence of antimatter, the mirror image of normal matter with positive electrons and negative protons. Dirac's idea was greeted with skepticism until 1932, when the antielectron was discovered. The hunt for the antiproton had begun, but it got off to a very slow start because to capture an antiproton, scientists would first have to make one. This required that a beam of protons be accelerated to 6 billion electron volts of energy, then smashed into a stationary atomic target. Even the Rad Lab's mighty 184-Inch Synchrocyclotron fell far short of this mark, and that machine had pushed the energy limits of cyclotron technology. However, as the Rad Lab entered the 1950s, there was new hope. The plans for the Rad Lab's next big accelerator began in 1948, but they underwent a number of changes through 1951. With a machine that had the energetic muscle to make antiprotons, Lawrence and McMillan put together two teams to go after the elusive particle. 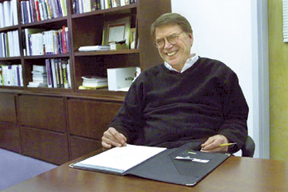 One team was led by Edward Lofgren, who managed operations of the Bevatron. The other was led by Emilio Segrè and Owen Chamberlain. The antiproton experiments of the Segrè and Chamberlain team began the first week of August 1955. Their first run on the Bevatron lasted five consecutive days. 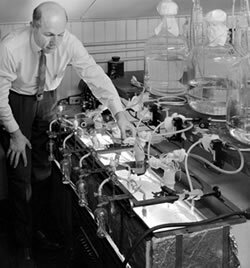 Lofgren and his collaborators ran their experiments the following two weeks. The Segrè and Chamberlain group returned on Aug. 29 and ran until the Bevatron broke down on Sept. 5. On Sept. 21, a week after operating crews had revived the Bevatron, Segrè and Chamberlain got their first evidence of the antiproton based on momentum and velocity. Subsequent analysis of emulsion stack images by Rad Lab colleague Gerson Goldhaber confirmed the discovery. For leading the discovery of the antiproton, Segrè and Chamberlain shared the 1959 Nobel Prize in physics, joining Ernest Lawrence, McMillan and Seaborg as Rad Lab laureates, with Calvin soon to follow. It was a record of institutional achievement without precedent, but the driving force behind this historical accomplishment did not live to see it. Throughout the spring of 1958, Ernest Lawrence had been suffering from a serious recurrence of his chronic colitis. Against medical advice, he honored the request of President Eisenhower to attend talks in Geneva with the Soviet Union about a ban on nuclear weapons testing. The trip proved too much for his failing health. Lawrence was rushed back to the Stanford University hospital for surgery. During his final days, he confided to his wife, Molly, “I wish I'd taken more time off. I would have liked to, you know, but my conscience wouldn't let me.” He died on Aug. 27, 1958, at the age of 57. Just 23 days after his death, the UC Regents voted to rename the Rad Lab as the Lawrence Berkeley Laboratory. An American genius and giant of science had passed away, but for the laboratory that now bore his name there was still much to come. Lab research in the news last month was as various as ever, ranging from a new supernova to insights into Alzheimer's disease — with some random pairings suggesting that inquiring minds often think alike. 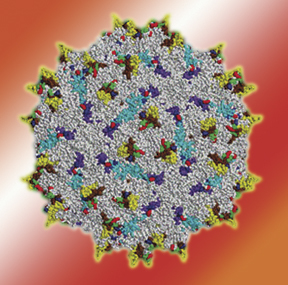 Researchers have evolved strains of adeno-associated virus that can evade the immune system. One efficient technique for designing proteins may be a different natural process known as “divergent molecular evolution.” The trick is to start with promiscuous enzymes. No, they're not naughty; they're capable of evolving along many different functional lines. As reported in the Feb. 22 issue of Nature, Jay Keasling, director of the Physical Biosciences Division, working with his graduate student Yasuo Yoshikuni and UC San Francisco colleague Thomas Ferrin, systematically coaxed the promiscuous sesquiterpene synthase enzyme of the Grand fir tree to rapidly evolve specializations for seven different protein products. Successful discipline of promiscuous enzymes points the way to many other useful protein designs. Networks of nanotubes spontaneously appear when copper penetrates the surface layers of a vanadium selenide crystal, triggering a phase change that causes expansion in all directions. Pipefitting one nanotube to another to build a network could take forever. Now a team led by Erdmann Spiecker, Andreas Schmid, Andy Minor, and Uli Dahmen of the Materials Sciences Division, working at NCEM, plus colleagues from the University of Kiel, has discovered a way to produce nanotube networks all at once. 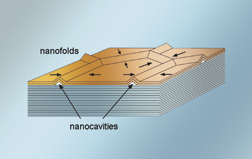 As reported in the March 3 Physical Review Letters, when a layered crystal of vanadium selenide is allowed to absorb copper atoms in a vacuum for several minutes, a phase change in the surface layers causes a hexagonal network of 30-nanometer-wide nanotubes to appear spontaneously. Possible applications include the transport and storage of minute amounts of material, and creating templates for nanowire circuitry. 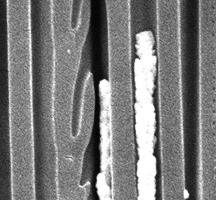 Nanoscale electrodes of porous platinum are formed by depositing platinum and copper in the pores of a ceramic filter, then leaching out the copper. An ingenious use of nanowires was described in the Jan. 10 Nano Letters by Kenneth Lux of the Materials Sciences Division and Karien J. Rodriguez of the University of Puerto Rico. They constructed electrodes by casting platinum-copper nanowires inside the cylindrical pores of an aluminum oxide filter membrane, then fumed them with nitric acid until the copper was leached out. Says Lux, “We basically destroy the nanowire, but what's left behind is a highly porous three-dimensional electrode” made of pure platinum, 200 nanometers in diameter and about 60 micrometers long. By placing arrays of these electrodes back to back, separated by a thin electrolyte — one side exposed to air, the other to hydrogen — Lux and Rodriguez constructed nanosized fuel cells; ganged together, these could provide milliwatts of power to electronics on a chip for many years. 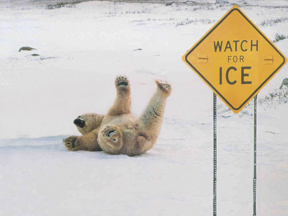 Ice is slippery. Nobody knows exactly why. Why is water liquid at ordinary temperatures and pressures, when its chemical formula says it shouldn't be? The answer lies with its molecular structure, a subject of discussion since the 1890s. The traditional view, recently reaffirmed by Richard Saykally of the Chemical Sciences Division and his colleagues, is that every water molecule joins with four others to form tetrahedral clusters. Experiments at SLAC in 2004 suggested otherwise, however, finding rings and chains of water molecules instead. Now David Prendergast of the Chemical Sciences Division is joining an effort led by Giulia Galli of UC Davis to settle the question through computational chemistry. With a DOE grant of 2.5 million hours of processing time, the group plans to run ab initio simulations of water on Argonne National Laboratory's IBM Blue Gene supercomputer. 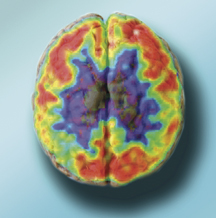 PET scans and MRI reveal changes in the brain associated with cognitive problems later in life. 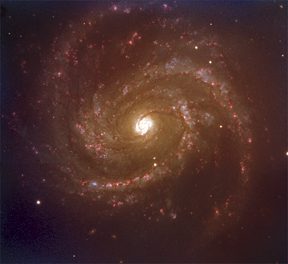 New images of the galaxy Messier 100 from ESO's Very Large Telescope were used to study supernova 2006X. Early in February, Japanese and Italian amateur astronomers independently discovered Supernova 2006X in the Messier 100 galaxy. Lifang Wang of Berkeley Lab's Physics Division and his longtime supernova-chasing partners at the European Southern Observatory and the University of Texas persuaded ESO to train its Very Large Telescope on the Type Ia supernova while it was still getting brighter. By obtaining spectropolarimetry and other data from this nearby supernova (just 50 million light years away), the astrophysicists hope to collect “a great wealth of information” on Type Ia supernovae, the best astronomical tools for studying the dark energy that fills the universe. ay Marx, a particle physicist at this Laboratory who over the past 30 years served as project leader for the PEP-4 experiment at SLAC that included the first Time Projector Chamber (TPC), the Advanced Light Source (ALS), and the STAR experiment at RHIC, is leaving. This week Marx was named the Executive Director of LIGO, the Laser Interferometer Gravitational Wave Observatory, dedicated to the detection and study of cosmic gravitational radiation. Marx, who came to Berkeley Lab in 1976 from a faculty position at Yale, has most recently been serving as the General Sciences Deputy for Projects. In that capacity, he has helped with management aspects of such initiatives as LARP, IceCube and GRETINA. He will be remembered here for his ability to lead complex scientific projects that involved many individuals from many different scientific and engineering disciplines. Marx has compared his leadership role to being the captain of a ship, in that you must set a clear overall direction, assemble the right people for the tasks at hand, and then clear the way for them to get their jobs done. Of the three major projects he has led at this Laboratory, Marx remembers PEP-4 as being the greatest challenge. With the STAR project, which included the world's largest TPC, Marx felt he'd gone the full circle and returned to his roots in particle physics detectors. STAR is one of two major experiments at RHIC seeking to understand the properties of nuclear matter in the conditions that prevailed a millionth of a second after the big bang. For his new job at LIGO, Marx said he has had to “learn a whole new kind of science,” involving laser interferometry and Einstein's General Relativity theory. Operated by the California Institute of Technology and the Massachusetts Institute of Technology, through funding by the National Science Foundation, LIGO consists of two widely separated observatories within the United States — one in Hanford, WA and the other in Livingston, LA — that operate simultaneously so that signals from cosmic gravitational radiation can be separated from locally generated noise. Gravitational radiation appears as waves in the space-time fabric much like waves in a pond from a cast stone. Cosmic gravitational radiation can be generated by the rapid motion of large masses such as the merging of two neutron stars or black holes. By measuring the interference between beams of laser light bouncing back and forth between a 4-kilometer L-shaped array of suspended mirrors, LIGO can detect the passage of these tiny space-time waves. Not at all surprising, Marx's new role will again entail being responsible for a big project as well as the LIGO scientific program, and operations of the LIGO Laboratory and its two observatories. LIGO has recently begun an 18-month-long science run that is expected to yield the first direct observation of gravity waves. Plans call for LIGO to undergo a $185-million, five-year upgrade, scheduled to start in 2008, that will increase its sensitivity by a factor of 10. As those who know at this Laboratory could tell the folks at LIGO, their project could not possibly be in better hands. Alysia Marino, who worked in the Nuclear Science Division while earning her Ph.D., has received this year's Mitsuyoshi Tanaka Dissertation Award in Experimental Particle Physics from the American Physical Society. Marino's doctoral thesis, “Evidence for Neutrino Oscillations in the Sudbury Neutrino Observatory,” reported neutrino measurements substantially enhanced by the addition of table salt to SNO's heavy water. Kevin Lesko supervised Marino's work and Physics Division's Marjorie Shapiro served as her faculty mentor. Marino is now at Fermilab. Members of the Microscopy Society of America have elected Berkeley Lab materials scientist Michael O'Keefe as its president-elect. He will take office in 2007. 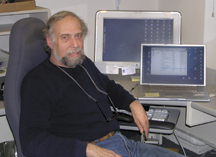 O'Keefe's work with computer processing of through-focus images contributed to the record-breaking resolution of the National Center for Electron Microscopy's One-Angstrom Microscope and its ability to distinguish light atoms like nitrogen or lithium in the neighborhood of heavier atoms like gallium or cobalt within the crystal lattice. He is currently spending a year at the Department of Energy's headquarters in Washington D.C.